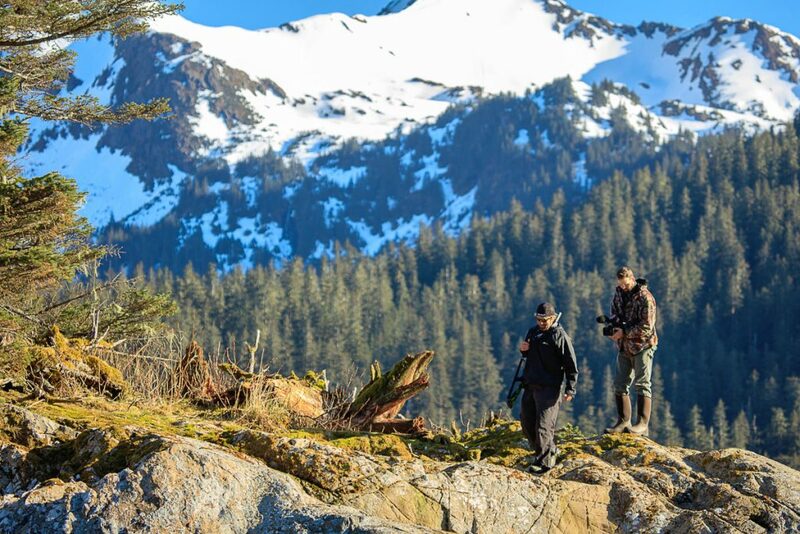 Blaine Anthony, AKA The Bear Whisperer, host of The Bear Whisperer television show aired on the Sportsman Channel, travels throughout North America in search of the most dangerous and misunderstood big game animals. On this trip he is on an Alaskan bear hunt. Considered to be one of the only “true” bear conservationist employing real conservation methods such as tagging, tracking and maybe the most important conservation efforts of all, hunting. Every year I look forward to one trip more than any other, Alaska. I think it’s because this trip is not so much about “the hunt” as it is about the beauty and solitude Alaska offers. This trip started like every other, meeting in Homer, a small city on Kachemak Bay on Alaska’s Kenai Peninsula, to board the yacht. This five-day trip takes us 125 miles South-West around the coastline then North-East towards Nuka Island where there is no civilization, no cell phone reception, just complete untouched Alaska wilderness. Alaska is over populated with Black Bear and with more and more animals such as Grizzly bears moving in, their food and range is being diminished. A black bear can live 30 years or more, so it doesn’t take long before they over populate. The other advantage of hunting is the great table fare it provides and when we arrive back to land, there are always native Alaskans waiting for us who need the meat to survive Alaska’s brutal winters. The meat is never wasted and tastes delicious. This year I will be hunting with my custom YHM 6.8spc rifle topped with my Hawke Optics Endurance scope. Probably one of the most important pieces of equipment I have with me is my Hawke Sapphire binoculars, not only do I have to be able to spot and judge bears at extremely long distances, it gives me the ability to enjoy nature at its finest watching everything from wales and seals in the ocean to wolverines and grizzly bears on shore. On the first day we headed out on the boat alongside a beautiful stretch of Alaska coastline with a mixture of beach, woodland and rock hills. I was watching on shore with my Hawke binoculars and saw what might be the biggest bear I have seen to date. I was watching on shore with my Hawke binoculars and saw what might be the biggest bear I have seen to date. He was walking between the shore line and the wood line. With no hesitation, I asked the captain to stop and bring me to shore in the zodiac to get a better look at this bear. After hitting the beach, we had quite a walk, wading through the ocean, over rock hills, and finally making it within 500 yards of the bear. I lifted my Hawkes and I could see the bear much closer and he was everything I thought he was. Now the challenge started, I had to close the distance on a wide-open beach, nothing between me and a giant bear. I wore all black as the bears eye sight is not as good as most animals, I wanted him to think I was another bear. I got to 209 yards and got into prone position. When hunting a bear, the proper place to aim and shoot at a bear is like most animals, directly behind the shoulder. We are very conscious of never letting any animal suffer in any way (including starving to death due to over population) when harvesting an animal, and shooting behind the shoulder is the largest target to aim at (the lungs and heart) with the least amount of suffering to the animal. I put the crosshairs on the bear and slowly pulled the trigger harvesting my largest Alaskan bear to date. This left me four full days to enjoy Alaska’s scenery and wildlife. I got a chance to walk on parts of Alaska where most likely no other human foot had ever been. I have to say I can’t wait until next year when I leave for Alaska again and hope that I get as lucky as I did this year. To see more from Blaine Anthony click here.